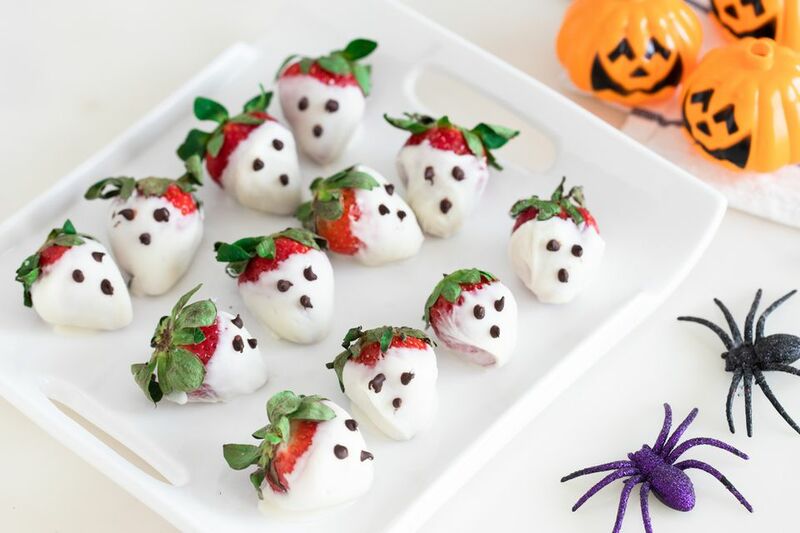 Ghost-shaped strawberries are so easy, it's scary. Instead of dipping the fruit in the traditional semi-sweet chocolate, they're dunked into white chocolate instead and given ghostly faces with dark chocolate. The delightful dessert is an easy and elegant addition to a grown-up Halloween menu, but also simple enough to make with young helpers. Wash the strawberries and pat them dry. Make sure they're thoroughly dry and don't have any wet patches, otherwise you'll have trouble dipping them. Melt the white chocolate in the microwave, stirring after every 30 seconds until it's smooth and fluid. If you are using white chocolate chips, they might be quite stiff when you melt them, so you can add a spoonful of vegetable shortening to make the chocolate more liquid if necessary. While you're waiting for the white chocolate to harden, melt the semi-sweet chocolate chips. Pour it into a paper cone or plastic baggie with a small hole cut in the corner. Decorate the strawberries with the chocolate so that they have eyes and mouths and resemble ghosts. Let the chocolate set completely before serving. The Ghost Strawberries are best eaten the day they are made. Store them in the refrigerator until serving.